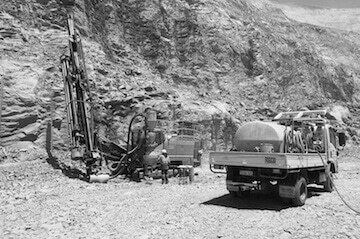 Rock on Ground provides specialist drilling, blasting, explosives supply and RC grade control drilling services for Australian based mining projects. The company is also renowned for its work on major civil infrastructure projects providing controlled blasting when it is required in close proximity to current infrastructure. Rock on Ground runs a fleet of Sandvik top hammer drill rigs DP1500i, DP1500 and DP1100 to provide quality small hole diameter drilling for 89mm to 140mm diameter blastholes. The DP1500i has successfully drilled 140mm blastholes at numerous hard rock open pits. Rock on Ground provides larger DTH drilling with its fleet of Atlas Copco D65 drill rigs that can drill 115mm to 203mm blastholes. Our drill crews are professional drillers, trained to operate safely and efficiently. They are experienced in all facets of blasthole drilling including collar piping in wet hard pits and presplit drilling. Rock on Ground was born out of early contracts for the likes of Rio Tinto, BHP, FMG and Roy Hill that involved providing close to infrastructure blasting for major resources expansions; Rock on Ground provided blasting services next to live rail on most of the rail capacity expansion projects in the Pilbara. Rock on Ground is also highly experienced in blasting for gold mining projects where ore dilution is a major factor in blasting activities. 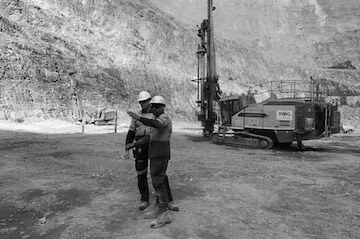 Our team is different in that our stringent blasting QA and control procedures ensure mining and civil operations comply with DMP requirements. Rock on Ground provides RC grade control drilling services through its fleet of Atlas Copco L8-30 RC- Grade Control drills. The drills are crawler mounted, and capable of providing a quality sample down to 54m. Sourcing explosives through supply agreements with major explosive suppliers, Rock on Ground has the added benefit of owning and operating a fleet of MMU/MPU trucks to deliver ANFO and emulsion products down the hole. 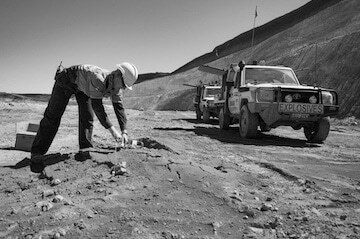 Our project teams are experienced at establishing and operating major bulk storage and reload facilities for both major mining, and short-term civil projects.